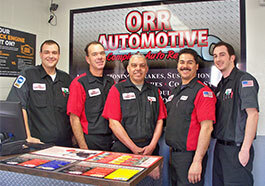 Perform vehicle safety inspection, change engine oil and filter and rotate tires while checking suspension. If the vehicle is driven less than 7,500 every six months, this maintenance should be completed at six month intervals. Inspect exhaust system and check for damage; inspect steering system, ball joints, suspension joints; inspect brake pads and rotors/drums for wear, replacing parts as necessary; check automatic transmission if equipped with dipstick, replacing fluid if necessary and inspect the cooling system. In addition to the 15,000 mile service recommendations, the air filter must be changed. Up to the 100,000 mile service, all maintenance is covered by the alternating 7,500, 15,000 and 30,000 mile services. At 100,000 miles the platinum-tipped spark plugs and positive crankcase ventilation valve must be changed. The alternation between the scheduled service intervals restarts at 105,000 total vehicle miles. Be sure to refer to your vehicle's individual maintenance schedule for any unique requirements. Diesel engine maintenance may vary significantly.